Businesses have been using billboards for decades as far as outdoor advertisement is concerned. A dynamic ads lasts only for 30 seconds, but a billboard stays at the same spot for several months. However, billboards do not always fit the bill. So, the question is, how should you promote your business? Brochures and banner ads are outdated and used by many advertisers. If you want to try something unique, then advertising inflatables are your ideal solution. Inflatable advertising items are large, flaunt a unique look and can be used by all types of businesses. An inflatable ad is an inexpensive way of advertising, getting you higher visibility and frequency before all your prospective clients and customers. Business owners have always preferred inflatable ads due to its affordable and effective nature. Business promotion is the most expensive. So, if one gets an opportunity to advertise effectively, yet at a cheaper amount, it will obviously be grabbed by any marketer. That is exactly what has happened with inflatable advertising products. This type of advertisements is suitable for all types of commercial signaling that makes use of signage which is designed to be full of air. The advertisements may come in any shape and size, but its motto is to promote a product or service and send across a message regarding a certain business. Inflatable ads are available in various forms: inflatable furniture, custom inflatable tents, billboard, illuminated tube, air dancer, sky dancer, custom inflatable costume, archways, giant inflatables, inflatable balloons, helium-inflated blimps, etc. All these are apt at drawing the attention of your target audience. The best aspect of these ads is that these allow you to present your products and services to your consumers in a fun and exciting manner. These advertisements are bound to grab the attention of any pedestrian, at any location, thus, making your ad campaign a success. Inflatable ads can be used in places where other kinds outdoor ads cannot be; thus, allowing you the freedom to promote your business in unique places and enabling you to grab all the attention, like, on water. Besides, you can use it big sporting events, beaches , etc. Such ads are memorable simply because they are fun. They often remind us of our childhood when we used to visit birthday parties and fairs. They are colorful, come is a huge variety of shapes and sizes, and mostly in friendly characters. You can obviously make a customized ad for your business. Remember, the crazier the more memorable. To make sure that viewers remember you, you need to make sure that you are visible to more and more people. Thats how you can increase your brand name. These advertising products can be used at special events like conventions, festivals, fairs, etc. that is expected to have a huge number of people. When you promote your business with a gigantic balloon, the ad is bound to be seen in all directions. This way you make the best use of commercial space, drawing the attention of everyone present around. While signs and billboards are awkward to be stored and reused, inflated ads are not. The former is generally painted and printed over or torn down after they have been used, due to their limited nature, but the latter can be easily deflated and stored for being used later. Unlike other offline marketing mediums, inflatable items are not overexposed. People still get surprised when they see a giant product replica and that surprise factor is the key to register a product/service in a consumers' mind. You can get the advertising inflatables in various sizes as per your requirements. 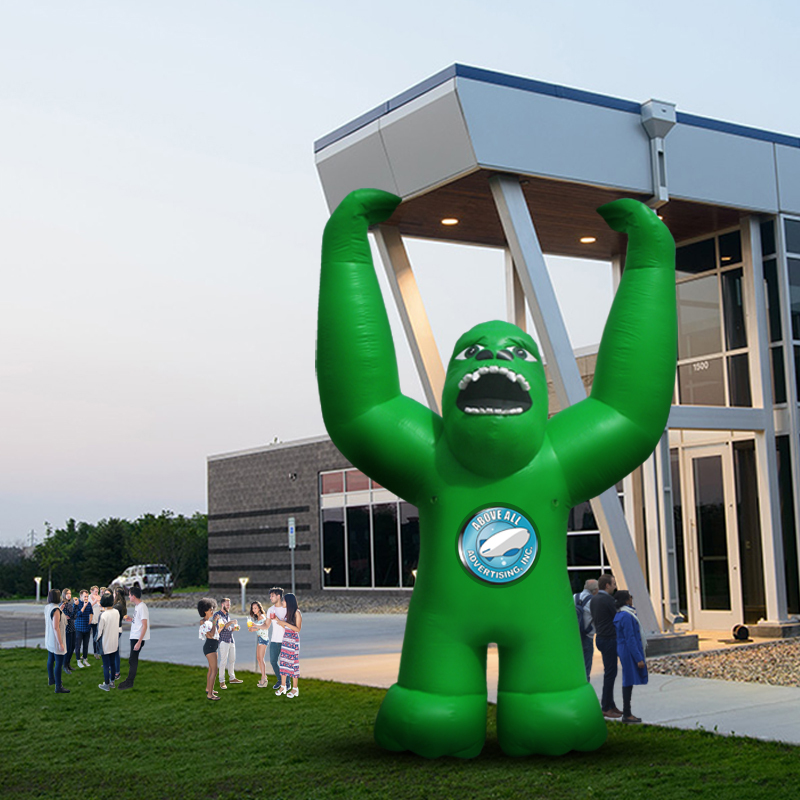 In fact, an inflatable advertisement can be as tall as 24 feet. As these are made in three dimensions, they look very real and grab the viewers' attention. If you have designed a brochure or rented a billboard before, then you know how much money these things cost. On the contrary, advertising inflatables are easily affordable. Moreover, inflatables last for a long time and thus, the return on investment is really impressive. The reach of inflatables is astonishing. You can literally place them anywhere for business promotion. Dust, water, and heat do not damage the appeal of your marketing tool. For example, you can order for a large ball with your brand logo on it and place it in the pool during a water polo competition to promote your sportswear brand. Similarly, you can hover a helium blimp over a sports stadium to give your brand the maximum exposure. Thousands of people in the stadium will be able to see it from all directions. 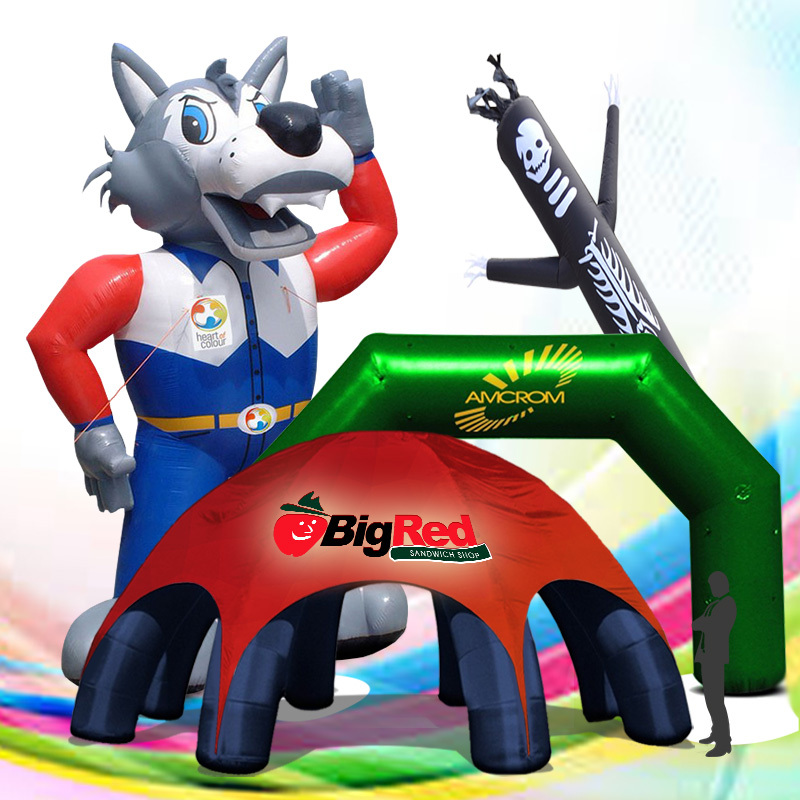 Just take a look at any famous advertising inflatable supplier's portfolio and you will find more than enough options. You can get anything from large costumes to product replica and furniture to tents at budget-friendly rates. The design, color, text can be customized as per your recommendations. No other marketing tool gives you this much freedom. If you have never used advertising inflatables before, then this is the right time to invest in them. Your target audience will love them and as a result, your business will grow rapidly. 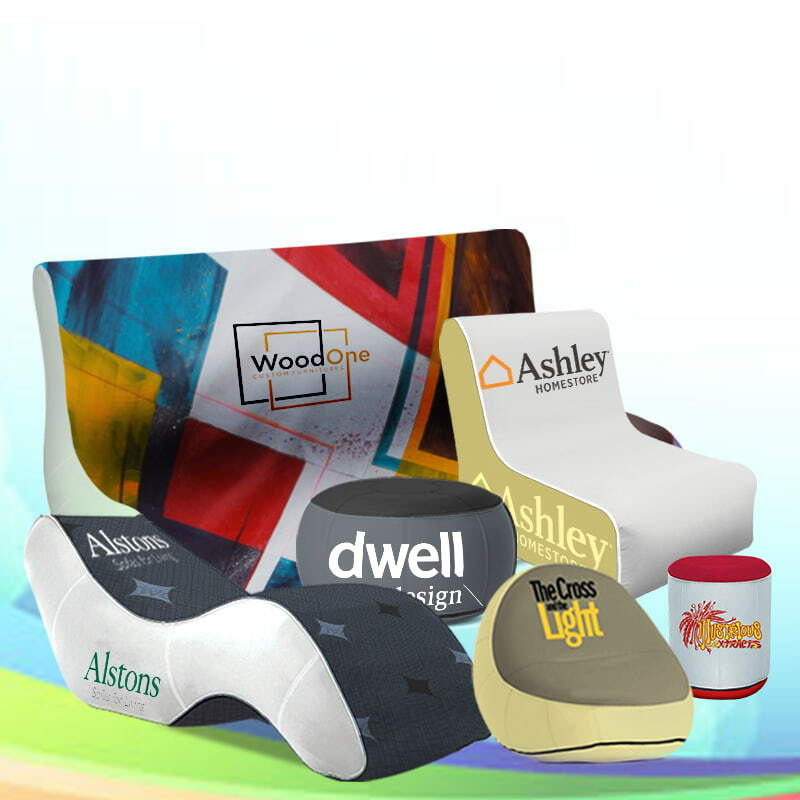 You see, inflatable furniture and other types of inflatable advertising products pose only pros as far as outdoor advertisement is concerned. Make sure you use them if you are planning an outdoor ad campaign.